I'm not in school anymore, but I'm married to a teacher, I babysit for teachers and my boys are all in school, so we are very much tied to the school year. Even though I never want summer vacation to end, the start of a new school year somehow still feels like a fresh start, even more so than the beginning of January. It also makes me feel like I need to get things organized. After the carefree, quilt-whenever-I-want days of summer, suddenly being confined to evenings and weekends (and maybe the occasional nap time) makes it feel like I need to have everything sorted out so I can actually get stuff accomplished in the time I have. We're almost a month into school now, and to help me get more organized, I asked a few quilters I admire (and who seem to get so much done!) to give me their best tips for getting, or staying, organized. Here's what they had to say. * Learn your limits. It's hard to prioritize when everything is a priority with a quickly approaching deadline. * Another top tip would be: "Make a prioritized list... and cross things off!" I love my Quilter's Planner since it prompts me to make that prioritized list at the beginning of each month, and also at the beginning of each week. Physically crossing things off that list makes me not only more productive and organized, it makes me feel WAY more mentally on top of the game. 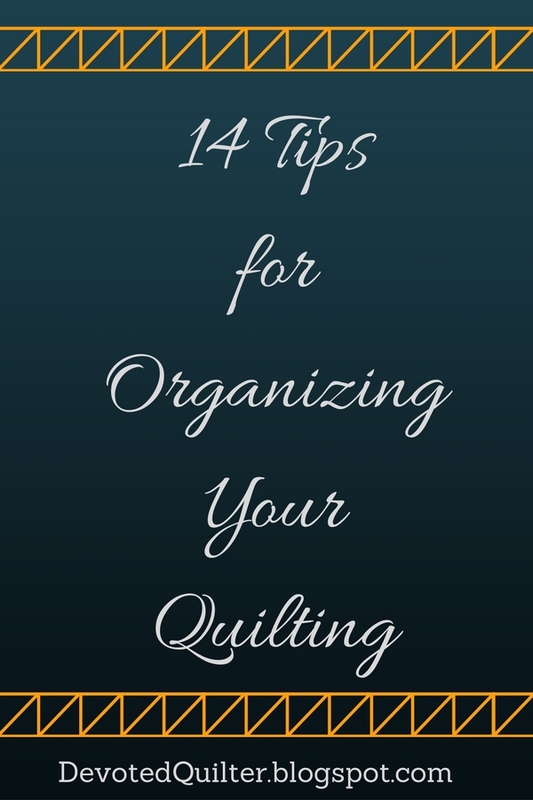 For the record, the list includes not only quilting goals, but also personal goals (I include cleaning here) and work goals (I include my blogging here, even though it's not technically "work", it helps me to separate it from quilting goals). I actually am better at keeping up with cleaning my house AND get more accomplished in my sewing and blogging categories. When I was a little girl my mother taught me to always put away the toys I had been playing with before getting something new out. I guess that habit has carried over to my sewing. 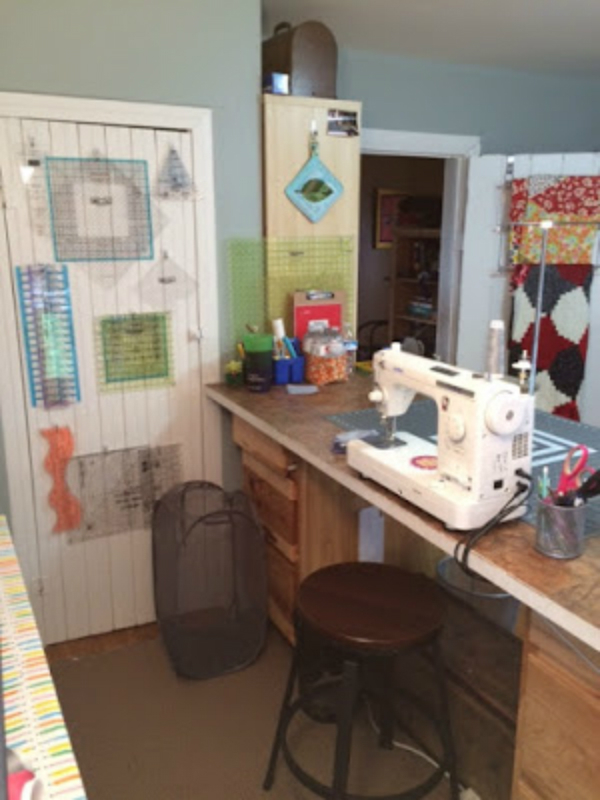 When I am switching gears between projects or starting a new project, I always reset my sewing space to zero. I sort and put away any cutting scraps, extra yardage and waste. Starting fresh with cleared off spaces clears away mental clutter too, which helps me to enjoy and focus on the new task at hand. 1. This may sound like a commercial, but the Quilter's Planner has really helped me organize my home, sewing, and work commitments all in one place. I use the monthly calendar to schedule blog posts (I usually try to schedule out at least 2-4 weeks of posts in advance), and make note of different deadlines. Then I use the daily calendar to write my to do lists out for that particular day. I used to use this little free monthly calendar but I found that there was never enough room to really write things out and it was so small I lost it frequently. 2. Between work, kids, house, I usually do not have large uninterrupted times to sew or I start sewing around 9:30pm at night after the kids are in bed, the kitchen is clean, etc. I try to have a plan in place on what I am going to do when I get sewing time so I can jump right into a project. Otherwise, I waste too much of my valuable sewing time just figuring out what I am going to do, where I stored the fabric for the project, and what step I'm at. I try to have the project to be worked on next waiting on the cutting board or next to the sewing machine so even if I get a short 10 minutes to sew, I can make a little progress. There are lots of things I do, but I have two that have really made a huge difference in how well I stay organized. The first one is my Make-A-List posts. Each week I post a list of the (mainly quilt-y) things I need to work through that week, and review the list from the prior week to see how much of it I finished. Posting it on the blog makes me more accountable, and knowing that I'll be confessing to my progress (or lack thereof) keeps me on track during the week! I work better with a weekly list, but for some, a monthly list works just fine. And the second tip is: Command Hooks! These things are awesome - I use them to hold clipboards with current project info on them, to post inspiration pictures on my "inspire me" wall, and to basically utilize every spare bit of storage space I can find. Here's a picture of the outside of the closet door that is to my left as I sit at my sewing machine. I needed a place to store my rulers and templates, and realized that the outside of that door was wasted space - until I put Command Hooks on it! There are probably other places and ways to use Command Hooks - I find new ones every day! When I first began quilting, I made myself a promise. To be a finisher. I promised myself that I would always finish what I was working on before beginning something new. While it's not for everyone, as some people seem to manage quite well working on multiple projects at once, I only work on one project at a time. This policy has many advantages. My sewing space is limited, so keeping my work area used by only one project keeps things orderly. And my mind clear. If I step away from a project for any amount of time, I need to re-familiarize myself with what I was doing and what I had planned to do next. So working on only one project helps to keep me from making mistakes or forgetting steps. When my quilt is completed, I roll it up on a pool noodle to keep it from getting crease marks. And then it can be stashed away on a shelf until it is needed for my next trunk show or until it is either gifted or sold. My best tip for staying organized with all of the deadline sewing I do is to use some sort of planning system to keep track of everything. I use a very low-tech system of organized notes in my phone along with my calendar that I can access right on my phone. I have an at-a-glance "to do" list and then individual notes for each of my long term projects. That way I can always be thinking and planning no matter where I am, as long as I have my phone with me. My best tip would be to organize works-in-progress into boxes. 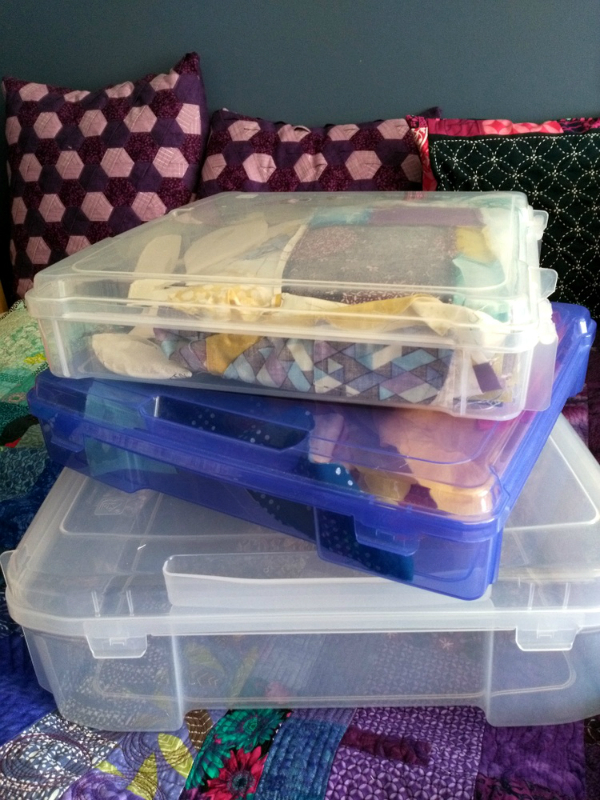 I purchase large, clear plastic craft containers from Michaels when they go on sale (usually around this time a year - I believe they are marketed to scrapbookers primarily). I keep all elements of a quilt together - sometimes even a quilt top for months. If I'm working on a long-term project, I'll pack a huge fabric pull into one of the larger boxes (the one on the bottom in the photo). Then, the project is protected and together as it waits its turn. It does get a little hairy when I'm looking for a specific fabric and its been hiding in one of my WIP boxes, but so it goes. :) Overall, they have changed the way I work for the better. 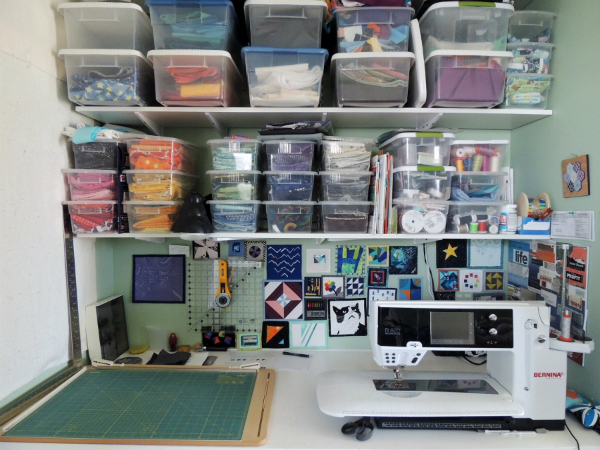 In terms of organization, I like a very tidy sewing space. I have limited desk space, so if I have fabric all over my work surface, I struggle to get anything done. It is also really important for me to see my fabric and have a way to store my WIPs. So I use clear plastic bins to organize my stash. The lower shelf is my fabric print collection. The upper shelf has larger bins for my WIPs and solid fabric. 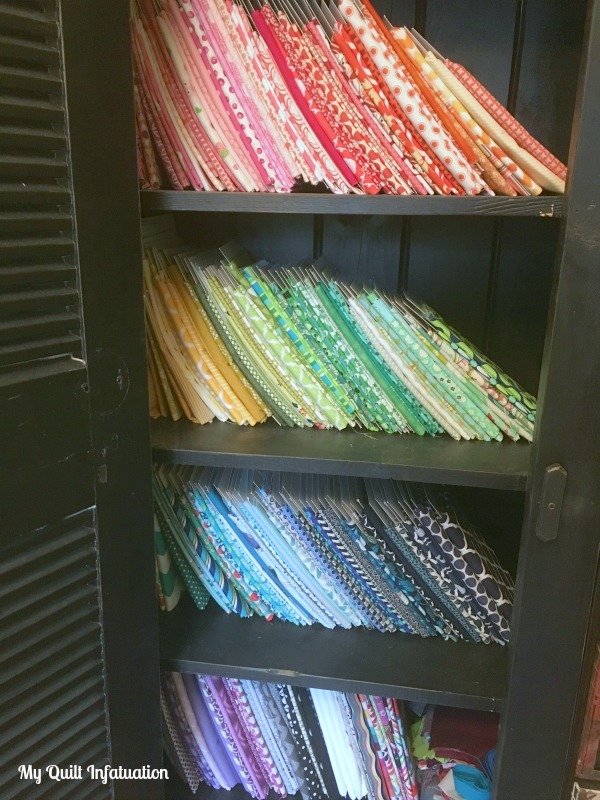 As I am working on a project, I will keep the fabric that I need next on top of the lower shelf of bins. For instance, the white and blue visible in this photo is the backing and binding for my Snowflake Shimmer quilt which is a QAL that is wrapping up, so I will be using that fabric soon! I really have two things that help keep me focused and organized, and therefore help me get a lot done. First- my stash- I took the time to put all of my fabric onto comic book boards, and organize them by color. Comic book boards are inexpensive, and they really help me see exactly what is in my cabinet. You might be surprised to see that my fabric cabinet is not huge. I don't keep an extremely large stash, because I like a lot of turnover in my fabrics. It keeps me from getting tired of what I have, and helps me actually use it. Second- my scraps! My scraps are organized by color into glass apothecary jars. Once again, you can see that these jars aren't huge. You would be surprised at how many scraps they can hold, though. I know that when these jars get too full, I have about enough scraps for a queen sized quilt (or a few lap sized quilts). I could use bigger containers for my scraps, but I know that if I collected more than this at one time, it would be tough to really clean them out all at once, and I like to do that periodically. Both of these organization methods help me find what I need for projects quickly, and as a result, I am able to get much more accomplished! And my best organization tip? WRITE IT DOWN! If I don't write an idea down, then I'm guaranteed to forget it. It doesn't matter if it's something that needs to be on my to-do list, something I want to try making, how much fabric I need to buy for a particular project or whatever it might be; I have to write it down. Now it's your turn. Are there any tips in this post that you want to try? Any great tips that help you stay organized? Be sure to sign up for my newsletter, The Bulletin, for monthly blog updates, a themed list of things to make and a family favourite recipe. You'll also get my free Wind Farm quilt pattern, just for signing up!